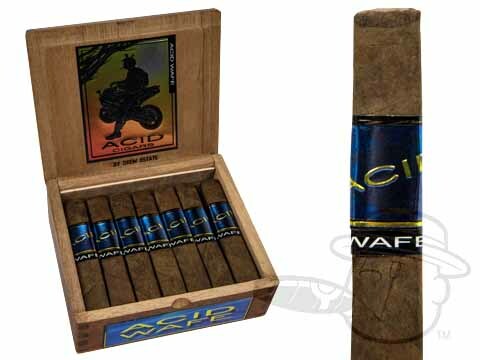 The Acid Wafe is Drew Estate's patented cigar vitola; its box-pressed shape is only a third of an inch thick when laid flat. It's infused with the Acid Blue botanical blend, and its unique shape allows for an ample amount of smoke to coat the palate. great taste, convenient size, great for traveling, hard to locate in stores. If you don't have time to smoke a Acid Kuba Kuba, try the Acid Wafe. I love the flavor, taste and draw of this cigar, very similar to the Acid Kuba Kuba. It really has great flavor and is not harsh at all. Highly recommended. This cigar is definitely different....flat box press and thin.....I enjoy these as a quick smoke when I don't have a hour or so to spare. Sweet and spicy.....burn is okay...no touch ups required. This cigar can be enjoyed by many....but I seem to think that it will be a hit with the ladies.....in both tasted and aroma....I think they are a little on the pricey side, but still a good quick smoke. I will keep a couple on hand, but do not visual me buying them a box at a time....sale only. Like most Acid products, it's good. Beware that it's pretty small (flat). Wish they made a longer one like this. comfortable smoke. If you like Acid then the Wafe is a very cool and unique somke! Very similar in flavour as a Kuba Kuba. With its unique square shape its a great smoke to give to a first time Acid smoker! Good flavor, but way too thin and small. I enjoy these smoke once and the while and they will be sure to make a lot of smoke to clear a room if needed. It comes with the usual acid cigar taste with a sweet taste from the moment you place it on your lips. Had a very heavy perfume scent before lit. Sweet dipped flavor. Burned uneven. Burned fast. Good flavor smoke though. I'd buy another for a quick smoke. Not bad, but you get what you pay for. Fun & Flat! If you like the Acid Kruse Blue Connecticut you will like These! They last a little longer and keep cool. Acid Wafe is rated 4.1 out of 5 based on 20 customer ratings.